Alcyone Ephemeris 4.3 is an accurate and fast astronomical ephemeris calculator covering the period 3000 BC to AD 3000. It calculates heliocentric, geocentric, and topocentric positions of the Sun (Earth), planets, 18 natural satellites, and small bodies (minor planets and comets) in ecliptical, equatorial, and horizontal coordinates, with optional corrections for parallax and refraction; rectangular coordinates, velocity, apparent diameter, magnitude, phase, lunar libration, orbital elements, differences for all of these, and more. In addition Alcyone Ephemeris offers a wealth of functionality: star chart generation, 3D-visualization of heliocentric and planetocentric orbits, plotting ephemeris data (as a function of time or in a parametric plot), searching for specific values, data export (Excel, HTML, XML, Text), scripting to write programs for more complex computations, and printing. Access to the complete Bright Star Catalogue, a calendar conversion tool, and an astronomical event calculator are available. The ephemeris calculation is based upon Steve Moshier's analytical ephemeris using trigonometric expansions for the earth and planets and the lunar ephemeris ELP2000-85 of Chapront-Touzé and Chapront for the moon, both adjusted to Jet Propulsion Laboratory's DE404 (see www.moshier.net). There are further adjustments in Alcyone Ephemeris, some optional, to JPL's more recent DE406, the most accurate long-term ephemeris. Small-body ephemeris calculations are based upon high-accuracy calculations performed by the HORIZONS ephemeris generator. These calculations require data files, which are available online for a growing number (200+) of bodies. Alcyone Ephemeris is fast. With an Athlon XP 6000+ processor, 100 calculations of geocentric longitude, latitude, and distance for the sun, moon, and all planets take less than 0.7 seconds. 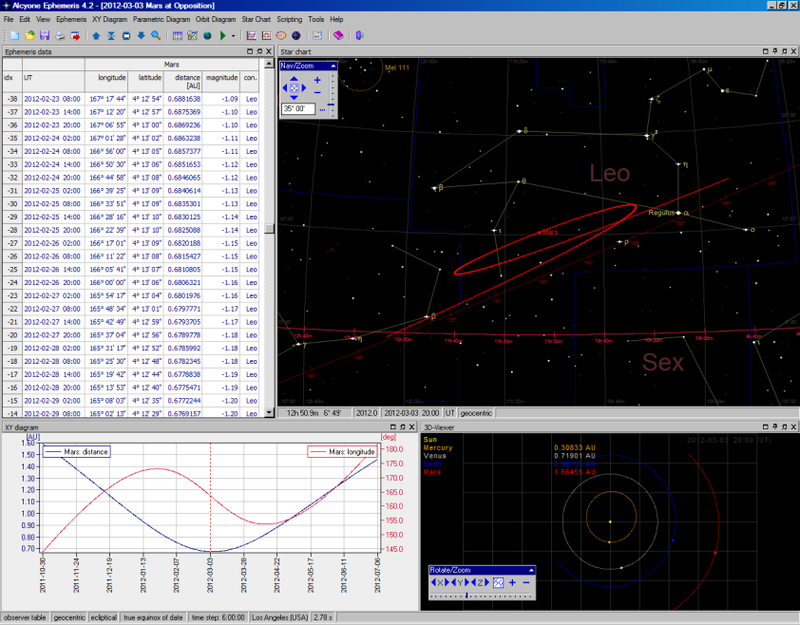 Alcyone Ephemeris runs under Windows XP/Vista/7.